Italian Family on Telegraph Hill (Plate B) - - 1919, Etching. Edition c. 20. Signed in pencil. Image size 11 1/4 x 6 7/16 inches (286 x 164 mm); sheet size 20 1/8 x 12 3/4 inches (511 x 324 mm). A superb impression, on off-white wove paper, with full margins (3 1/8 to 4 7/8 inches), in excellent condition. Printed in 1977 when the edition was completed. 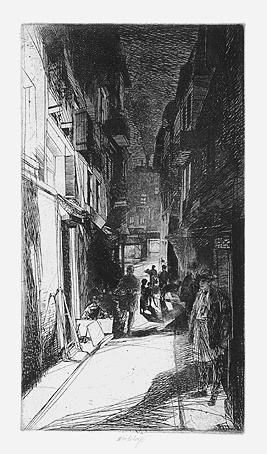 Black Alley (Plate B) - - c.1930, Etching. Image size 9 3/4 x 5 3/8 inches (248 x 137 mm); sheet size 13 x 9 1/2 inches (330 x 241 mm). A superb impression, on off-white wove paper, with full margins (1 1/4 to 2 inches), in excellent condition. Printed in 1978 when the edition was completed. 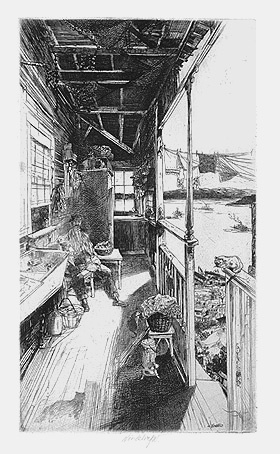 Collections: Achenbach Foundation, BPL, BM, MMA. 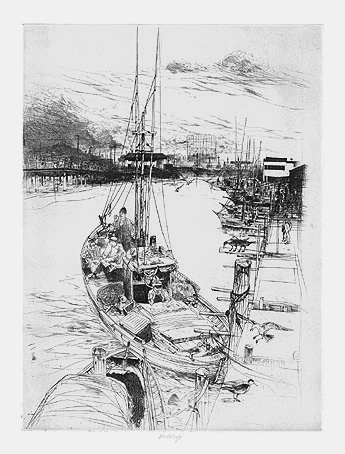 Main Boom & Hay Schooner (Large) - - 1931, Etching. Image size 7 1/4 x 11 3/8 inches (184 x 289 mm); sheet size 11 1/2 x 18 1/4 inches (292 x 464 mm). A superb impression, on off-white wove paper, with full margins (1 7/8 to 3 1/2 inches), in excellent condition. Printed in 1978 when the edition was completed. 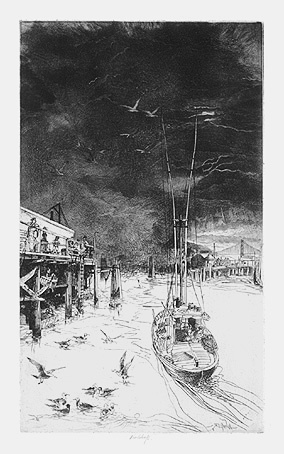 Storm Over the Pacific - - 1937, Etching. Image size 13 3/4 x 8 1/8 inches (349 x 206 mm); sheet size 18 7/8 x 12 7/8 inches (479 x 327 mm). A superb impression, on off-white wove paper, with full margins (2 1/8 to 2 3/4 inches), in excellent condition. Printed in 1977 when the edition was completed. Collection: McNay Art Museum, San Antonio. 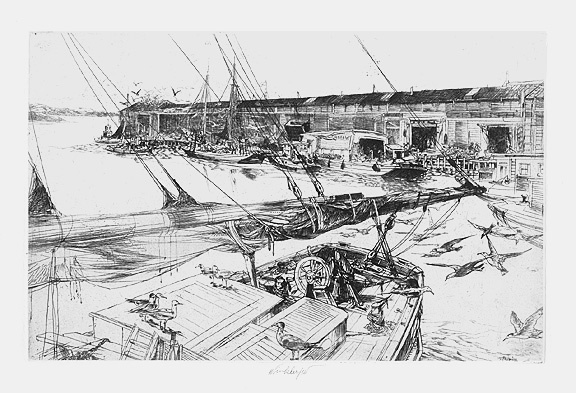 Sunday Morning on Fisherman's Wharf (Plate C) - - c.1940, Etching. Image size 11 3/4 x 8 11/16 inches (298 x 221 mm); sheet size 18 3/4 x 12 5/8 inches (476 x 321 mm). A superb impression, on off-white wove paper, with full margins (1 7/8 to 4 inches). A repaired tear (1/2 inch) in the middle right sheet edge, well away from the image, otherwise in excellent condition.